Is it fair to say that it took me six conferences until I finally felt like a non-newbie? Really? Nah… I’ve been having fun at the ATA Annual Conference since my first minute in Orlando in 2008. But I won’t deny that stepping out into the pool area at the Hilton (in the Walt Disney World Resort), which was filled with hundreds of people who all seemed to know each other, was intimidating. And then, I made my first few colleague friends… all Latinas! I still keep in touch with one of them, Natalia Moreno, and we’ve seen each other at other conferences. Since that first conference long ago, I have become ATA-certified in an additional pair (Spanish into English), a full-time freelancer again (almost three years ago!) and a lot more self-confident. 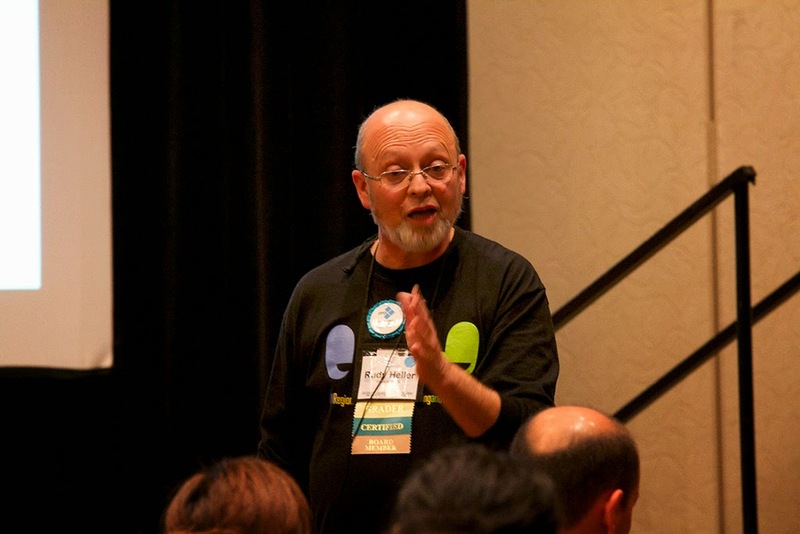 I have also gotten more involved in ATA’s Spanish Language Division (SPD), become a member of its Leadership Council and the Professional Development Committee, and started writing for Intercambios. In San Antonio, my conference experience was very different. I didn’t just meet new people and collect a small mountain of business cards. I built relationships and caught up with older and new-ish friends. The Division Open House. This was a great chance to see all my SPD colleagues, in a much smaller setting than at the Welcome Reception. Breakfast with the SPD Leadership Council. It was wonderful to get together as a group, since we usually don’t meet in person. Who was there? Helen Eby, Fran Samuel, Milly Suazo, Rudy Heller, Charo Veras-Welle (and her hubby, Asa), Lisa Carter, Virginia Pérez-Santalla and Julia Lambertini Andreotti. Rudy, an ATA Board member! 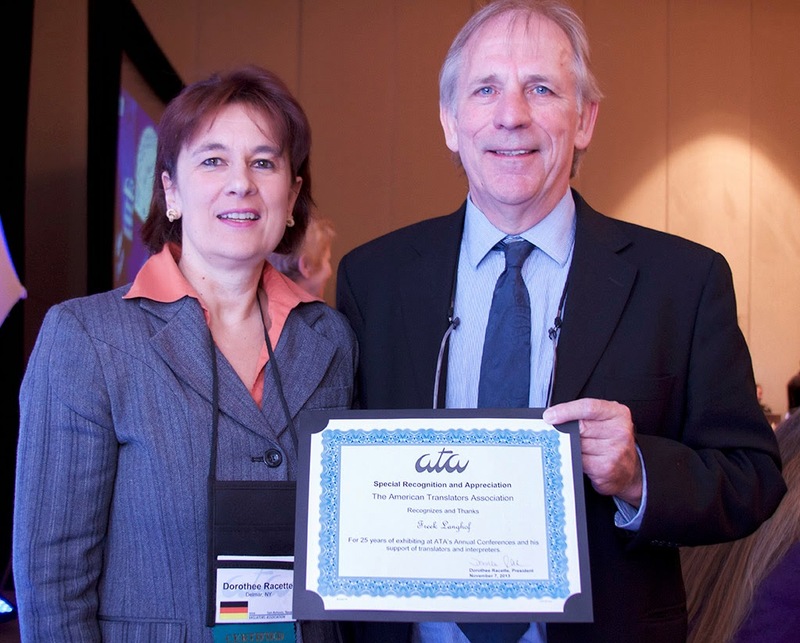 Our own Rudy Heller, mi compatriota, got elected to the ATA Board. I have no words to describe how awesome Rudy is. I don’t know how he does it, being a freelancer and an abuelo as well as a grader, part of the SPD Leadership Council and now a member of the Board. Meeting Siegfried Ramler. I had a chance encounter with Mr. Ramler, an interpreter at the Nuremberg International Tribunal. I had been kicking myself for not attending his presentations, because I didn’t find out about them on time. As someone whose great-grandmother was shot in the street by the Nazis, the moment brought tears to my eyes. He’s such a gentle person. The raffle at the SPD Dinner. When I talked to Milly about the door prizes, she wasn’t expecting people to bring that many things to raffle off. She ended up with 35+ items. Some were small, like key chains and magnets. Others included rum, pisco, wine, mole, alfajores, handicrafts and books (Judy Jenner’s The Entrepreneurial Linguist and Lisa Carter’s translation, The House of Impossible Loves). There were also licenses for SDL Trados and gift certificates from InTrans Books. One of the most coveted items was a subscription to the updated “Libro rojo” (or Diccionario de dudas y dificultades de traducción del inglés médico) by Dr. Fernando Navarro. I was a little disappointed that I didn’t win that. However, the winner was someone who will really benefit from it. She is a new friend, Anabella Tidona, who just started her master’s in medical translation via distance learning at Universitat Jaume I in Valencia, Spain—where Dr. Navarro will be one of her professors! Some long deserved recognition. Freek Lankhof of InTrans Books, a personal friend of both, my husband and I, has been exhibiting at the ATA Conference for years. I always get upset when I see people learn all the details of a book from Freek and then go buy it online… to save $2 or $3! We need to support InTrans Books—otherwise, Freek will stop coming to the conferences. Then, we won’t hear about the latest dictionaries and books or be able to buy them. This year, ATA recognized Freek for “25 years of exhibiting at ATA’s Annual Conferences and his support of translators and interpreters.” In addition, he was one of our special guests at the SPD Dinner—and had a great time dancing to the music of the mariachis. A skit at the After Hours Café. I walked in in the middle of this awesome skit that included music, poetry, improvisation and lots of laughs. I still enjoyed it a lot! It was about two guys (Vladimir Reznikov and José González) who were trying to win the favor of three Greek goddesses (played by one woman—Julia Grawemeyer). At first, the guys tried to wow Julia with existing poetry in Russian, Spanish, Italian, etc. However, she wanted something original. After all, they were translators and “supposed to make stuff up all the time.” The result, accompanied by guitar and harmonica, was a song in English about translators and interpreters, followed by a poem in Spanish, Russian, German and French and even improvised singing when José forgot the lyrics. Hilarious! The sessions. We all go to the conference for the sessions, right? No, but they are the icing on the cake. Some of the ones I liked this year, in no particular order: Barbarismos ortotipográficos by Jorge de Buen Unna (our Division’s Distinguished Speaker this year); Translating Court Decisions from Spanish>English by Holly Mikkelson; ¿Sin vergüenza o sinvergüenza? by my friend, Eva De Vallescar; 10 Tips for Aspiring Literary Translators by Lisa Carter; Making the Leap from Legal and Commercial Translations to Literary Translation by Marianne Reiner; and The Vocabulary of International Affairs by Joseph Mazza. I know I just got back from San Antonio, but I already can’t wait for next year in Chicago, and the one after that when ATA comes to my home city, Miami! See you there! Becky Katz is a full-time freelance translator. She is ATA-certified SP-EN and EN-SP. Becky was born and raised in Barranquilla, Colombia. She lives in South Florida, where she expects to see all her SPD colleagues during the 2015 ATA Conference.